Alba took us on a community adventure at Vodafone ES. How they managed to integrate plugins, or create a corporate theme for Icinga Web 2 … and much more. Dave took the long flight from our Australian Icinga partner Sol1 and shared his story about Icinga doing the monitoring for TV stations. I had the pleasure to invite Carsten and do a fresh talk on “Dev and ops stories – integrate everything into your monitoring stack”. We had some stories prepared for Grafana, Maps, Dashboards, Ticket Systems and last but not least logs and events with a little surprise at the end 🙂 Jens Schanz who is working at Müller, was attending the talk and just a few days later, he told us that they are now using Dashing, the Grafana module and also going for the Icingabeat and Elastic Stack. Michael presented the new NSClient++ REST API. 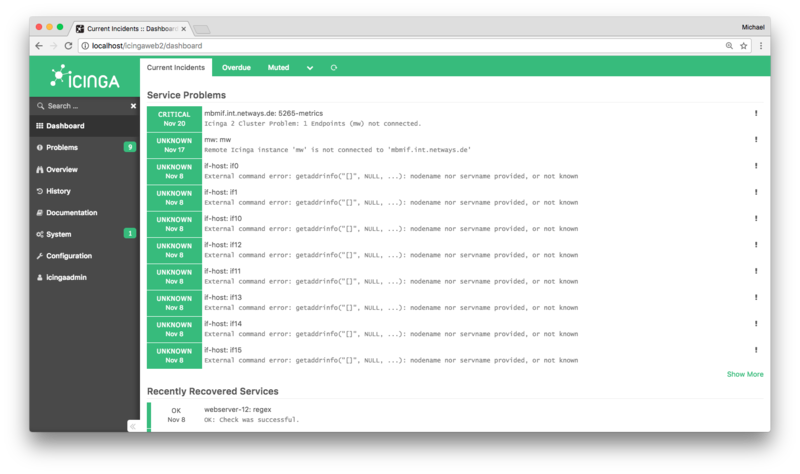 This replaces the old API and provides roles and permissions for better user management. It also got plenty of documentation this time. You will probably love the new possibilities it provides. Updates for the bundled version in Icinga 2 are already planned. 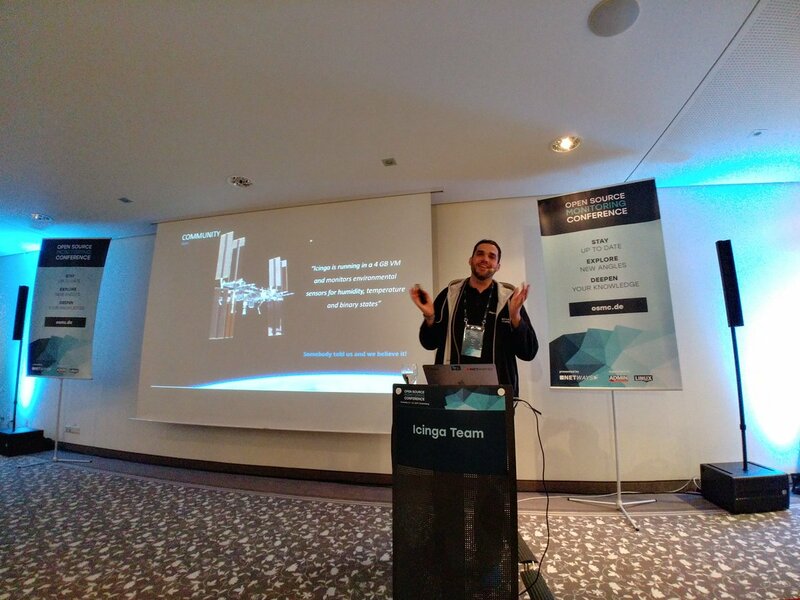 Our very own Bernd presented the newest Icinga updates. This includes the new shiny Icinga Web 2 v2.5 with the collapsible menu. In addition to that we’ve announced the new Graphite and Elasticsearch modules for Icinga Web 2. 2018 will also bring us the “Icinga stack” and additional benefits for partner customers in terms of Graphite packaging for example. Bernd also showed the Logstash output and Icingabeat in the demo. Marianne told us about her experience with Icinga 2, Icinga Web 2 and especially the Icinga Director. They have been using the Director since “somewhat pre-alpha”. She’s also given real life examples on why data and metric visualization matters. Tom did lots of Director magic in his talk. It was not an introduction, but actually targeting automated deployments, difficulties with parsing files (watch the demo for Excel at the end!). Lennart who is also contributing to the Icinga Puppet modules, joined Janina from GfK to do a hands-on talk on automated deployments for Icinga 2. Even with a live demo including the audience. Bodo is one of the community Docker container maintainers, and was really going for it and CI integration in his talk. Watch out for more container madness in the future. One of my personal favourites this year: Martin Schurz from T-Systems Multimedia took us onto a journey from old legacy monitoring systems into a new era of automation, containers and future integrations. They had evaluated CheckMK, OpenNMS, Prometheus, Zabbix and Icinga. Watch the talk to find out more about which tool they’re using now, and where they’re heading at. Kevin is working on a Python library which talks to the Icinga Director API. His talk provided insights on the latest developments, and how he’s been using it for automated thresholds with Ansible. The hackathon on Friday happened the third time this year, and was a mix of developers, admins and trainees. The introduction round highlighted several “hot topics” around Icinga, OpenNMS, Config Management, Automation, NSClient++, Icinga Web 2 modules, Elastic Stack, integrations, and much more. We also had the pleasure to welcome Steffen Siering from Elastic this year again, getting insights and ideas for our Elastic Stack integration (ElasticsearchWriter in Icinga 2 v2.8, Icingabeat, Logstash Output, Filebeat module, etc.). Dirk wrote a detailed blogpost over at the NETWAYS blog what we’ve achieved together. Navigate to Configuration > Modules and enable the module. Select the theme in Configuration > Application > General and save the changes. OSMC really was a blast. So many active community members, interesting talks and as Marianne told in her recap: Put crazy people together, and ideas become reality soon enough. Marianne blogged about her very own OSMC recap already, Marco also added his thoughts. Take a moment and watch the Twitter moments for OSMC too. The event location at the Holiday Inn was splendid as always, and so was the event organization as many participants told me. Checkout the archive and make sure you’ll be there next year, save the date: Nov 5 to 8, 2018.